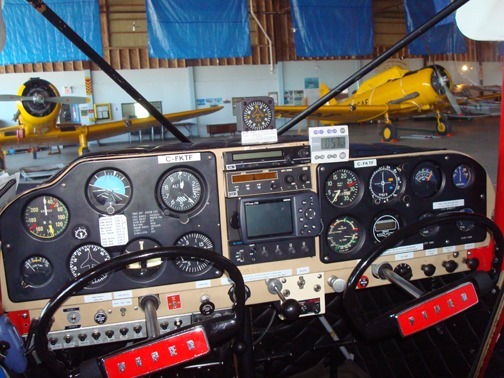 For certain, one of the most interesting parts of any aircraft is the instrument panel. 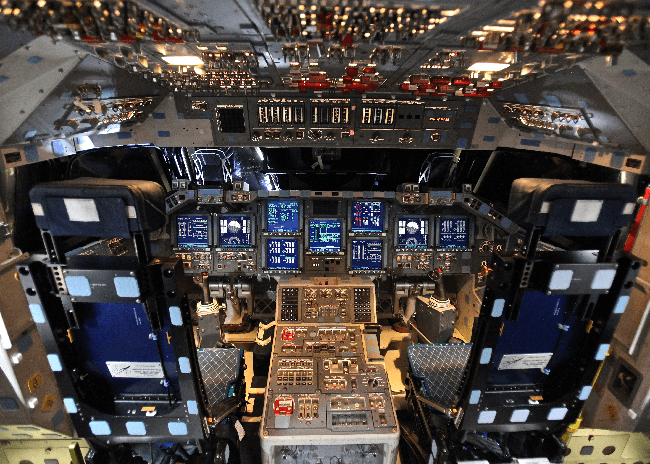 There are all-sorts of knobs, gauges and gizmos on the panel and it’s good to know what they are, how they work, why they are there and what they do. For that, you’ll talk to your flight instructor, but a little introduction is below. These days, there are two basic types of panel – “steam gauge” and “glass”. The first, as it would suggest, is made-up of mostly round gauges with needles – like the kind on your car for speed, RPM etc. They are easy to read and each gauge tends to do only one thing. The other type of panel is “glass” and comprised of computer screens with most functions built-into the display. These panels are commonly though-of as more efficient, displaying more data in a more organized and customizable way to the pilot. Steam Gauge type panel showing the standard “6-pack” on the left along with radios, portable GPS, and more. Recently (starting around the mid 2000’s), glass-panels are common in new aircraft. They are extremely capable, somewhat complex and require detailed training – but they have the same function as the older “steam-gauge” type panels (although they do more things, more easily and some-say, clearly). 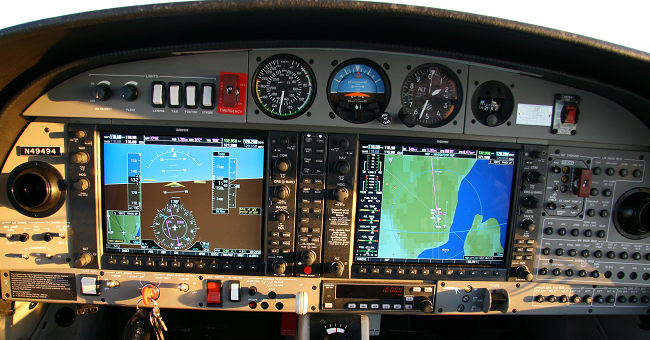 Garmin G-1000 “glass” panel with twin displays and full function integration. You’ll notice some “Steam” gauges above the panels too. Below are some of the instruments you’ll find on may trainiers and GA aircraft in Canada (and beyond of course). This give you your height above sea-level (not the ground). Sea level remians the same everywhere but the ground does not (think valleys and mountains). AI – Attitude Indicator (Artificial Horizon). Shows the pilot the aircraft in relation to the horizon ahead of them, just like looking out of the front window. It tells the pilot if the wings are up/down (turning) and if the nose of the aircraft is up or down (climbing/descending). Remember, the pilot can’t always see the horizon directly. 6-pack panel on a Zenair CH750. How fast you are going through the air you are in. This is not the same as how fast you are going over the ground as you may have a tailwind or headwind which impacts your actual ground speed. Older models are scaled in MPH and newer ones in Knots (a “knot” is a nautical mile per hour and is a bit faster than a standard MPH). How fast you are climbing or descending in feet per minute. How many revolutions per minute (RPM) your engine is making. For some aircraft this is also the speed of the propeller too but not always. An indication of the level of the wings (banking left or right) and the “yaw”, which is like understeer or oversteer on a car. Acts like a compass and advises the pilot of their heading in degrees. Used because compasses can give false readings in certain circumstances. Frequently set and adjusted by the pilot to ensure accuracy. Same as any compass really, shows the pilot their heading and magnetic directions. There are a few different types. Global Positioning System – shows the pilot where they are, often on a moving map overlay just like Google maps or your car GPS. The map is a special aviation one and there are many aviation points marked like tall towers, airports, navigation points etc. Used to navigate to or away from radio beacons and signals for navigation. 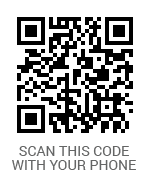 Used primarily by IFR aircraft (Instrument Flight Rules – flying in cloud and can’t see the ground). At some point in the future, may be totally replaced by GPS. There’s more – lots more. There are autopilots, radio nav-aids, engine monitors and more. For multi-engine aircraft (like twin-engine planes), there can be two of everything. The panel, depending on the make, model and type, can get a little crowded – but as a pilot, you learn it all!